Lauren Ruehlen puts up a shot between two KeKalb Co. defenders Friday in her first action for the Lionettes since last February. 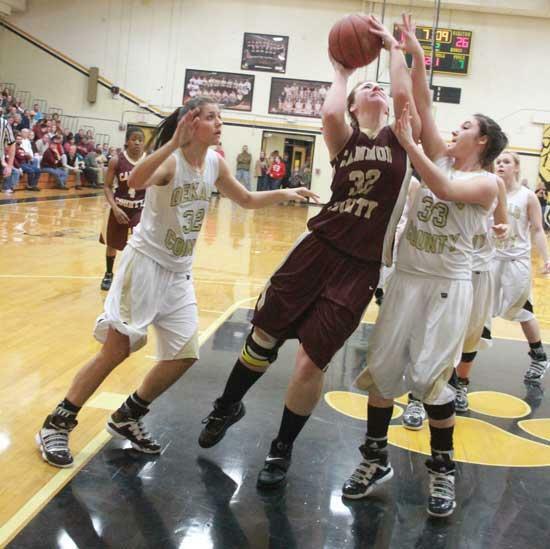 SMITHVILLE - An already strong Cannon County girls basketball team is getting healthy and the timing could not be better as the tight District 8-AA race reaches the halfway mark next week. Senior forward Lauren Ruehlen returned to the court against DeKalb County Friday for the first time since suffering a season-ending knee injury last February, and junior forward Lindsey Reed played in her second game since returning from a back injury earlier this season. "It is good to have everybody back because I think this team can be really, really good when everybody is gelling and playing to their capabilities," sixth-year Lionettes Head Coach Michael Dodgen said. "Those are two young ladies who have been looking forward to getting back and playing and their teammates are excited to have them back." No. 3-ranked Cannon County (17-2, 3-0 8-AA) not only gains the services of two quality players, but they are standouts who have career starts to their credit. Reed scored seven points in a 70-30 win at DeKalb County Friday, and Ruehlen finished with one but her success was in returning to the court. "It's been a long time," Ruehlen said. "Watching all my teammates play and not being able to help them was the toughest part of being out. I didn't do so good out there (Friday) but it felt great to be out there. (Reed and I) have to continue to get in shape and get our shot back and we will be fine." Ruehlen was set to return at the start of the 2010-11 season but she suffered a setback during the preseason. Diligent rehab and a positive approach aided Ruehlen's return. "(Ruehlen) has never complained and she has had some bad luck," Dodgen said. "She has worked hard and done everything she was supposed to in rehab in order to get back." The addition of Ruehlen and Reed bolsters Cannon County's inside game and adds game experience while creating match-up problems. "When people see us play they will see some different lineups they have not seen out there so that's a positive," Dodgen said. "We are tough to guard when we have all of our parts in place." Reed and Ruehlen will continue their comeback when Cannon County faces Upperman in a key District 8-AA battle at Robert A. Harris Gymnasium Monday at 6 p.m. Both are wonderful players glad to see them back in the game, they are a joy to watch.